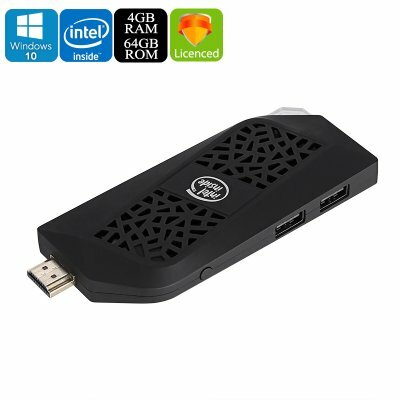 Successfully Added Meegopad T08 Mini PC - Licensed Windows 10, Quad-Core CPU, 4GB RAM, Intel HD Graphic, 64GB ROM, Dual-Band WiFi, 4K Support to your Shopping Cart. With the Meegopad T08, you’ll be able to turn any big screen TV into your own Windows PC. Thanks to its licensed Windows 10 Operating System, this TV dongle lets you take advantage of all Windows and MS Office features. It features an extremely compact design and is light in weight. This allows you to easily carry it along and plug it into any display of your liking. From now on, you’ll always be able to carry along your own mini PC filled with your personal files and media. Dual-Band WiFi connectivity lets you browse the web from your television at lightning speeds. You will be able to stream films, download files, and browse the web. With the Meegopad T08, you’ll never again be bothered by a slow internet connection. You’ll be treated to 64GB ROM and a 128GB SD card slot. Therefore, you’ll have enough storage at your disposal to download all your favorite games and media. To further increase your connectivity, it supports Bluetooth 4.0. This feature lets you easily share files and connect wireless gadgets such as a wireless keyboard or speaker to your TV box. Your Windows mini PC packs a sophisticated Intel Atom Cherry Trail processor. This Quad-Core CPU has been clocked at 1.44GHz and is capable of reaching turbo speeds up to 1.92GHz. Thanks to this, it provides you with an energy-efficient yet powerful performance. Along with its CPU comes 4GB RAM. Together, your hardware brings along enough power to tackle demanding 4K media, games, and software. No matter your demands, the Meegopad T08 is guaranteed to meet them. The Meegopad T08 Mini PC comes with a 12 months warranty, brought to you by the leader in electronic devices as well as wholesale electronic gadgets..